Spread Christmas magic throughout your daycare with this theme's countless arts & crafts decorating ideas for your little elves! This theme is a collection of our favourite Christmas decoration ideas. We are sure you will enjoy making theses with your group in the weeks leading up to Christmas! (Open picture frame-Christmas-Group of 9) Print and add a picture of each child in your group. 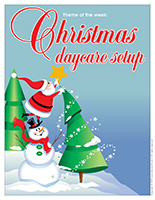 Laminate and display or give a copy to each child on the day of your Christmas party. (Open identification cards-Christmas) Print. Write the name of each child on an identification card. Use them to identify cubbyholes, personal belongings, etc. (Open posters-Christmas room identification) Print. 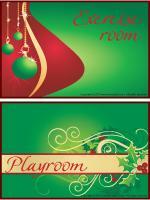 This series of posters can be used to identify the various rooms within your daycare during the Christmas season. Transform your circle time area to make it look like a Christmas ornament. Use decorative ribbon or green and red adhesive tape. Invite children to stick Christmas stickers on the floor. Add multicoloured lights. Hang a Christmas garland made of red and green construction paper links prepared by the children. Hang unbreakable Christmas ornaments from the ceiling along with snowflakes and pictures of all kinds which represent Christmas. Collect boxes of all shapes and sizes. Let children wrap and decorate them. Tie them together with ribbon. Arrange the train around your circle time area. Children can each sit in one of the Christmas train's cars. Make several decorations with your group. Set a real or artificial Christmas tree in one corner of the daycare. Let children add their decorations to the tree. The Christmas tree lights can remain lit during naptime. Children will love it! Purchase a paper tablecloth. With your group, cut Christmas illustrations out of magazines and flyers. Glue them on the paper tablecloth. You will have an original tablecloth for your Christmas party. If you prefer, children can draw their own Christmas decorations on the tablecloth. Add Christmas lights around your doorway. Department stores offer various types of lights. You can even find some shaped like Santa Claus, Christmas trees, or snowmen. Red, green, or multicoloured lights are great too! If you are lucky enough to have a large window within your daycare, let children paint Christmas designs on the window with poster paint. The activity itself is somewhat messy but the poster paint is easy to wash off afterwards. Variation: A large banner of white paper can easily replace the window. (Open shapes-Christmas) Trace the shapes you wish to use onto cardboard and cut them out. Keep only the contour of the shapes. Glue cellophane paper on the cardboard. Add glitter to the cardboard frame. Display in a window. Use white paper to cover the walls of your arts & crafts area completely. Let children decorate the area as they wish using materials related to Christmas. Create a magical Christmas reading corner for your group. Set a large appliance box in the area and make your own Christmas curtains by hanging Christmas-coloured ribbons along the front of the box. Inside, hang multicoloured lights and deposit a few Christmas stuffed animals or puppets. Add a selection of Christmas books which you have previously covered with sparkly wrapping paper. (Open Christmas workshops) Print and display the posters to identify your various workshops during the Christmas period. Hang Christmas lights throughout the daycare. Use rope and clothespins to hang them from the ceiling. Hang an old bed sheet, a piece of tulle, or a square piece of fabric from the ceiling. Make several holes in the fabric and hang Christmas ornaments and snowflakes. Cut strips of red, green, and white construction paper. Link them together, alternating colors. Hang the garland within the daycare. (Christmas garland) Cut out the models. Deposit the models on folded sheets of paper and cut out the shapes (leaving the sides attached). When you unfold the paper, the shapes will form a string. Make your own piñata shaped like an ornament, bell, or star. Fill the piñata with Christmas treats. Hang it from the ceiling until the day of your Christmas party. Cut a large piece of adhesive paper (Mac-Tac). Remove the paper backing and deposit it, sticky side up, on the floor. Visually divide the paper into two equal parts. On one side, add a few tablespoons of green, red, and white poster paint. The quantity depends on the size of your paper. Secure the envelope on the floor with adhesive tape on all sides. Invite children to walk on the envelope to mix the paint. You may choose to lay several paint envelopes on the floor. Be sure to verify that the envelopes remain sealed regularly during the activity. Print several different Christmas illustrations. Glue them on the floor throughout the daycare to create paths which lead to different areas such as the bathroom, cloakroom, etc. Trace a pair of reindeer tracks onto sponges and cut them out so you have a right and left hoof. Dip these hooves in washable poster paint and print them on the floor, walls, etc. (Open picture frame-Christmas) Print for each child. Use the frames to decorate each child's cubbyhole. You may take a picture of each child dressed up like a Christmas tree. Cut a wreath shape out of cardboard. Children paint and decorate their wreath with all kinds of Christmas candy pieces. Display near your daycare entrance. (Open shapes-Christmas) Print for each child. Have children tear and crumple red, green, and white tissue paper. They can select a shape and fill it with the crumpled tissue paper. Use the Christmas shapes to decorate your bathroom or another room within the daycare. Bring your trees to life. Transform them to make them look like various Christmas characters or just add Christmas lights. Make your own giant Santa Claus. Stuff him and set him near your daycare entrance. Line the walkway leading up to the daycare with soda bottles filled with water and tiny Christmas trinkets (erasers, figurines, ribbon, glitter, food coloring, etc.) If you prefer, you may also fill them with sand and cover them with Christmas decorations. Cut an ornament shape out of adhesive paper (Mac-Tac). Let children fill the shape with a variety of fun Christmas objects (metallic confetti, glitter, feathers, pieces of tissue paper, etc.) Add another piece of Mac-Tac on top and display in a window. (Open models-ornaments) Print. Let children decorate the ornaments with glitter, paint, and other materials. Cut them out and assemble them to form a garland. Hang it within the daycare or near the daycare entrance. Trace and cut out several different sizes of ornaments. (Open models-ornaments) Decorate the ornaments with glitter, lace, ribbon, cotton balls, confetti, etc. Glue the ornaments back to back on either side of a long ribbon or string. Hang from the ceiling. Wrap Styrofoam balls with aluminum paper, metallic paper, or tissue paper. Use paperclips as hooks. Simply insert one end in the Styrofoam balls. Prick several different lengths of colourful pipe cleaners into a Styrofoam ball. Hang the original ornaments from the ceiling or in your Christmas tree! Ask parents to provide old ornaments they no longer use. Give them a shiny, multicoloured look by layering tissue paper and white glue on the ornaments. Cut a Styrofoam ball in two. Each child paints and decorates half a Styrofoam ball. Photograph your group standing in front of a homemade decor. You can, for example, hang a large piece of wrapping paper on the wall or have them stand in front of your Christmas tree. Glue a picture on each child's half Styrofoam ball. If you wish, you may varnish the ornament. Attach a pipe cleaner and children can hang their ornament in their Christmas tree. Provide a variety of Christmas napkins. Have children tear and cut them into tiny pieces. Children then apply white glue to a Styrofoam ball before covering it with the napkin pieces. (Open models-Christmas stockings) Print. Let children decorate the Christmas stockings with glitter, paint, or other materials. Cut them out and assemble them to form a garland. Hang it within the daycare or near your daycare entrance. Trace and cut out various sizes of Christmas stockings. (Open models-Christmas stockings) Children decorate them with glitter, lace, ribbon, cotton balls, confetti, etc. Glue them back to back on either side of a long ribbon or string. Hang from the ceiling. (Open models-Santa Claus) Print and let children decorate the characters with glitter, paint, and various materials. Cut them out and assemble them to form a garland. Hang it within the daycare or near your daycare entrance. (Open models-Santa Claus) Trace and cut out various sizes of the model. Decorate the characters with glitter, ribbon, cotton balls, confetti, etc. Glue them back to back on either side of a ribbon or string. Hang from the ceiling. 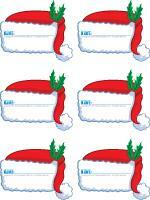 (Open miniature Santa Claus) Print, cut out, and color the pieces. Glue them on an empty toilet paper roll to create a miniature Santa Claus. Hang from the ceiling or in your Christmas tree. (Open craft-Santa face) Print for each child. Have children paint a paper plate using red poster paint. Have them cut out the eyes, nose, mouth, and beard. Help them glue them on the plate. Decorate with cotton balls. Sprinkle glitter over the cotton balls. Next, ask children to cut out the hat and color it red. Staple it to the plate. (Open craft-Santa clock) Print and cut out the various pieces. Give each child a paper plate and help them glue the numbers around the contour of the plate, like on a clock. Make sure they place "12" at the top and "6" at the bottom. Cut out the two hands. Make a small hole in the center of the plate and secure the hands with a fastener. Glue the remaining pieces on the plate so it looks like Santa. The plate represents Santa's belly. Tear, crumple, and glue red, black, and white tissue paper on the character. (Open craft-Santa) Add cotton balls on the beard. Assemble with fasteners or string. Ask children to cut a triangle out of construction paper to represent Santa's hat. Glue cotton balls along the bottom of the hat. Glue the triangle on the top of a paper plate. Draw Santa's face and glue cotton balls to the bottom of the plate to represent Santa's beard. Hang from the ceiling. (Open miniature elf) Print, cut out, and color the pieces. Glue them on an empty toilet paper roll to create your elf. Hang from the ceiling or in your Christmas tree. (Open models-Elf) Print. Let children decorate the shapes with glitter, paint, and other materials. Cut them out and assemble to form a garland. Hang it within the daycare or near your daycare entrance. (Open models-Elf) Trace and cut out different sizes of the model. Decorate the elves with glitter, lace, ribbon, cotton balls, confetti, etc. Glue the elves back to back on either side of a ribbon or string. (Open models-candy cane) Print. Let children decorate the shapes with glitter, paint, and other materials. Cut them out and assemble to form a garland. Hang it within the daycare or near your daycare entrance. (Open models-candy cane) Trace and cut out different sizes of the model. Decorate the candy canes with glitter, lace, ribbon, cotton balls, confetti, etc. Glue the candy canes back to back on either side of a ribbon or string. Trace a candy cane shape on construction paper and cut it out. Fill the shape with red and white pieces of crumpled tissue paper. (Open models-Christmas lights) Print. Let children decorate the shapes with glitter, paint, and other materials. Cut them out and assemble to form a garland. Hang it within the daycare or near your daycare entrance. (Open models-reindeer) Print. Let children decorate the shapes with glitter, paint, and other materials. Cut them out and assemble to form a garland. Hang it within the daycare or near your daycare entrance. (Open models-reindeer) Trace and cut out different sizes of the model. Decorate the reindeer with glitter, lace, ribbon, cotton balls, confetti, etc. 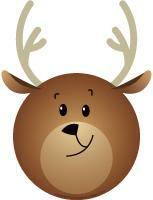 Glue the reindeer back to back on either side of a ribbon or string. Hang from the ceiling. (Open models-gifts) Print. Let children decorate the shapes with glitter, paint, and other materials. Cut them out and assemble to form a garland. Hang it within the daycare or near your daycare entrance. 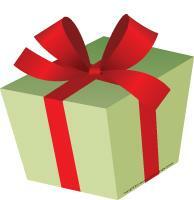 (Open models-gifts) Trace and cut out different sizes of the model. Decorate the gifts with glitter, lace, ribbon, cotton balls, confetti, etc. Glue the gifts back to back on either side of a ribbon or string. Hang from the ceiling. (Open models-Christmas tree) Print. Let children decorate the shapes with glitter, paint, and other materials. Cut them out and assemble to form a garland. Hang it within the daycare or near your daycare entrance. (Open models-Christmas tree) Trace and cut out different sizes of the model. Decorate the Christmas trees with glitter, lace, ribbon, cotton balls, confetti, etc. Glue the Christmas trees back to back on either side of a ribbon or string. Hang from the ceiling. Roll a sheet of green construction paper to form a cone. Let children decorate their Christmas tree with ribbon, candy, glitter, etc. Deposit children's Christmas trees on a desk, on top of their cubbyholes, or near your daycare entrance. Trace the outline of a Christmas tree on a large piece of cardboard. Provide several catalogues and store flyers children can tear pages out of. Let them crumple the paper and fill the Christmas tree shape with the paper balls. 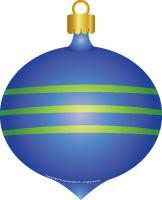 (Open models-Christmas tree) Print and trace the model on green construction paper and cut it out. Apply white glue liberally and add pine needles. Decorate. If you wish, you may also add sparkles. (Open models-Bell) Print. Let children decorate the shapes with glitter, paint, and other materials. Cut them out and assemble to form a garland. Hang it within the daycare or near your daycare entrance. 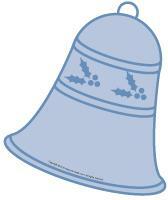 (Open models-Bells) Trace and cut out different sizes of the model. Decorate the bells with glitter, lace, ribbon, cotton balls, confetti, etc. Glue the bells back to back on either side of a ribbon or string. Hang from the ceiling. Wrap an individual coffee creamer container with aluminum foil. Make a hole in the center and add a pipe cleaner. The pipe cleaner should exceed the top of the container. Inside the container, twist it to create a hook and thread a tiny spherical bell on the end. Secure by twisting the pipe cleaner. Hang your Christmas bell in your tree. (Open models-Wreath) Print. Let children decorate the shapes with glitter, paint, and other materials. Cut them out and assemble to form a garland. Hang it within the daycare or near your daycare entrance. Purchase a green garland. Use it to create a wreath which can be hung on your door. Use tiny pieces of double-sided adhesive tape (or hot glue) to add a large quantity of candy pieces, candy canes, ornaments, etc. Cut the center out of a paper plate, keeping only the contour. Decorate and add a bow and ribbon so you can hang your wreath.